Māori who settled New Zealand in the 13th century from the Pacific carried some foods with them. A particularly important crop in their cargo was the kūmara (sweet potato). 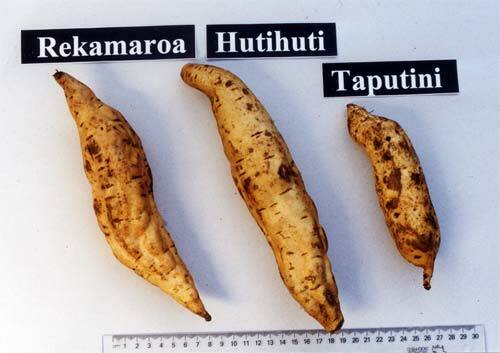 Pictured here are three pre-European varieties, ‘Rekamaroa’, ‘Hutihiti’ and ‘Taputini’.The kūmara commonly seen in New Zealand today is derived not from these ancient cultivars, but from varieties introduced by Europeans during the 19th century.